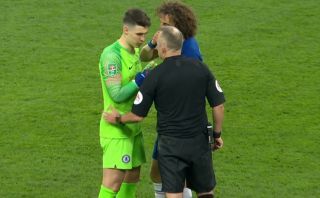 Chelsea defender David Luiz has revealed what he told teammate Kepa Arrizabalaga as the controversy at Wembley played out in extra-time. After initially going down with cramp, Maurizio Sarri wanted to replace his first-choice goalkeeper for veteran Willy Caballero ahead of the penalty shoot-out. However, Kepa essentially refused to come off as he gestured to the bench that he was fine, leaving Sarri incensed on the sidelines as it appeared as though his decision was ultimately being ignored by his shot-stopper who was refusing to come off. The pair both insisted after the game that it was a misunderstanding and a breakdown in communication as Sarri thought Kepa had to come off with an injury, but that doesn’t necessarily explain why he was still fuming as the teams prepared for the shootout. Whether it’s merely the pair putting on a united front for the media and supporters is unclear at this stage of if they are perhaps being genuine with their reasoning, but Luiz has revealed that he did tell his teammate to “respect the decision” that Sarri was making. “I just said to him we have to respect the decision of the coach,” he is quoted as saying by Sky Sports. The Brazilian stalwart added that he couldn’t confirm why Sarri wanted to replace Kepa as he wasn’t on the sidelines, but the mere fact that he told the goalkeeper to respect the decision would again suggest that the 24-year-old ultimately ignored his manager’s decision. Chelsea went on to lose to Man City on penalties, with Kepa managing to save just one of the spot-kicks.